More from M∙A∙C - Plush Lash & Lashes. Attention M·A·C Cosmetic fans - right on the heels of Matte2 (Matte Squared) and Mattene, M·A·C is launching a new must-have mascara, Plush Lash and a makeover of their Lashes line. Plush Lash ($11): Instantly plump up lashes for over-the-top voluptuous volume. Contains natural humectant sodium hyaluronate, pro vitamin B5 conditions the lash, while the vitamin E derivative acts as and antioxidant. The combination of waxes and film formers allow for super even and smooth application. Double “V” groove design and hollow, tightly interwoven filaments allow product to sit on top of the brush and in the feed grooves providing very good volumizing and quick building performance. Use flat side first to push lashes upward and curl. Separate and comb lashes with longer bristles. And if you are looking for Lashes, then you will get them. Acclaimed celebrity lash designer Christina Smith who has designed custom lashes for Hollywood leading ladies including Liza Minnelli, Kate Hudson, Hayden Panettiere and Gisele Bundchen, created 11 exclusive Lash styles with original, new features and streamlined packaging just for M·A·C. Color – M·A·C Lashes have a unique blend of black and brown natural hairs, so they blend more naturally with your own lashes. Great for even the fairest of lashes. Clear Band – M·A·C Lashes feature a ground-breaking thin, clear band for easy application and flexibility. Lashes can move, bend and blend. Shorter Width – Say goodbye to trimming false lashes to fit. 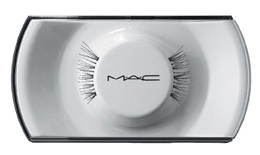 M·A·C's newly designed Lashes have a shorter width, so they fit comfortably to the length of your natural lash line. Intentional Imperfection – No two lashes are the same or perfectly symmetrical. M·A·C created intentional imperfections in each lash design to create a more natural effect. The new M·A·C Lashes are packaged in a unique white tray that holds the lashes around a circular post. The post is used for ease of identification, with the left lash on the left side, and the right lash on the right. The white inner tray slides into a clear outer case and locks into place for secure portability. In addition to beautifully displaying the lashes, the new case also allows for easy storage and reuse. M·A·C Lashes will last through approximately 3-6 wears, with proper care. When removing from packaging or the lash line, gently lift one end and peel off slowly and carefully to keep LashesLashes intact. Store lashes in a cool, dry area as humidity or warm temperatures (often found in the bathroom) may compromise the curl of the lash. Lash Styles, Pricing and Availability: M·A·C Lashes retail for $11.00 USD and will be available on counter OCTOBER 2007. #30: Individual lashes. Three lengths available in one package for the ultimate customization. #31: Natural style length with a wispy texture. Perfect for those who want fullness every day. #32: Natural style length that includes a combination of lash bundles and individual hairs for a natural fullness. #33: Natural style length. Separate lash bundles give a flirty fringe. #34: Slightly more dramatic length. Wispy texture with winged corners. #36: A full lash favorite that creates a naturally dramatic look. M·A·C Lashes should be used with a safe lash adhesive. Try Duo Adhesive available on www.maccosmetics.com for $8. Get In Line for this Cat Eye Kit!